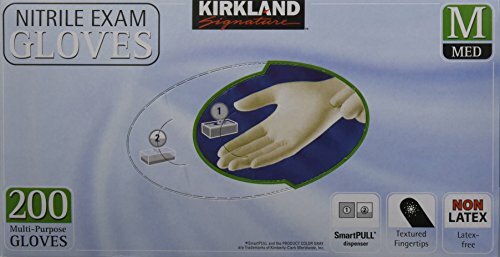 Kirkland Signature Latex-Free Nitrile Exam Multi-Purpose Gloves, Medium, 400 Count by Kirkland Signature at Blog Free Here. Hurry! Limited time offer. Offer valid only while supplies last. 2 x 200 Nitrile Exam Gloves Multi Purpose Kirkland Size Medium. Two (2) boxes - 200 per box. 400 multi-purposes gloves total Size: Medium. 2 x 200 Nitrile Exam Gloves Multi Purpose Kirkland Size Medium. Two (2) boxes - 200 per box. 400 multi-purposes gloves total Size: Medium. Latex-free. Powder-free. Comfortable fit and feel. Great tactile sensitivity. Superior barrier protection Fits either hand. Non-sterile. Textured fingertips. Single-use only. Acceptable for use with certain chemotherapy drugs. Dental patient examination glove. Great for food service, health care, chemotherapy, dental, auto, home, sanitary. Latex-free. Powder-free. Comfortable fit and feel. Great tactile sensitivity. Superior barrier protection Fits either hand. Non-sterile. Textured fingertips. Single-use only.